Those who keep professing that "peak oil" is just around the corner or has already been reached should take a look at this Harvard paper (ht John A). 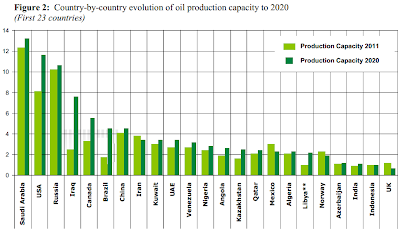 The author (Leonardo Maugeri) analyzed oil exploration and development projects field by field globally to determine how oil production is expected to grow. 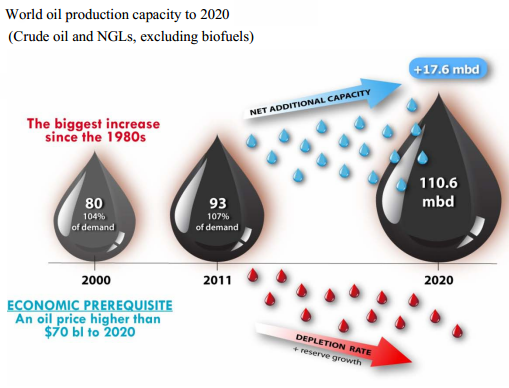 Assuming oil price stays above $70 per barrel, here is what the increase in production will look like by 2020 (in Million Barrels per Day). Here is the breakdown of changes in production by country. The largest capacity increases will come from Iraq (whose reserves are thought to be the largest in the world), followed by (interestingly enough) the US, Canada, and Brazil.